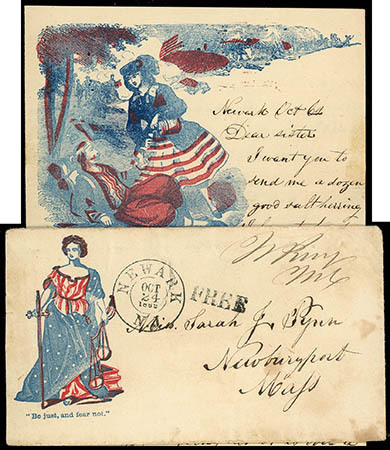 "Be just, and fear not", red white and blue Lady Liberty patriotic design free franked by "W. King, MC" to Newburyport Mass., "Newark N.J. Oct 24 1862" cds and matching "Free" rating handstamp, original Fallen Soldier red white and blue patriotic lettersheet written by soldier in hospital writing about the food being grapes and fruits but longs for salt herring and biscuit, her says "There was about five hundred soldiers sent out of the hospital yesterday and there is another load going off soon after that they are going to discharge all that is not fit for service", F.-V.F. 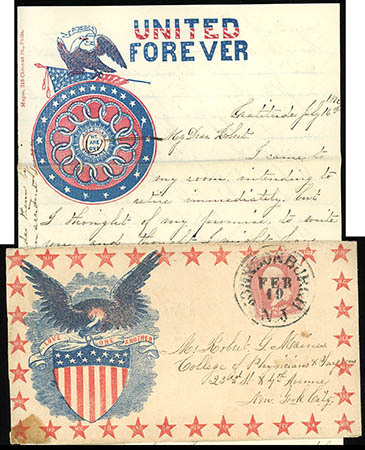 Eagle and Shield with State Stars, red white and blue design bearing 3¢ rose (65) tied by socked-on-nose "Johnsonburgh N.J. Feb 19" cds to New York N.Y., original red white and blue United Forever patriotic lettersheet datelined July 16th 1862, F.-V.F. Flag, red and blue design with "Protect It!" 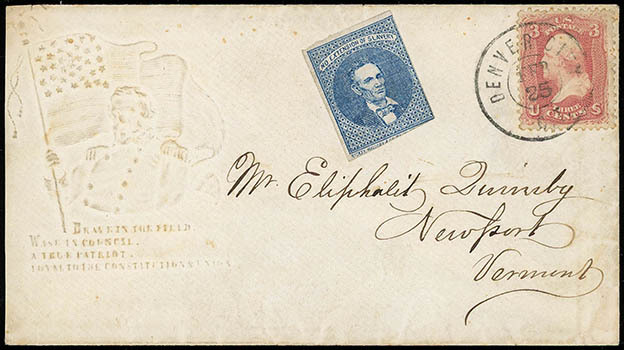 slogan below, on cover to Tully, N.Y., franked with 1861, 3¢ rose tied by bold rimless "Martinsville, Ill., Dec 31" cds (month inverted), Very Fine and attractive. Walcott No. 3060 Estimate $100 - 150. 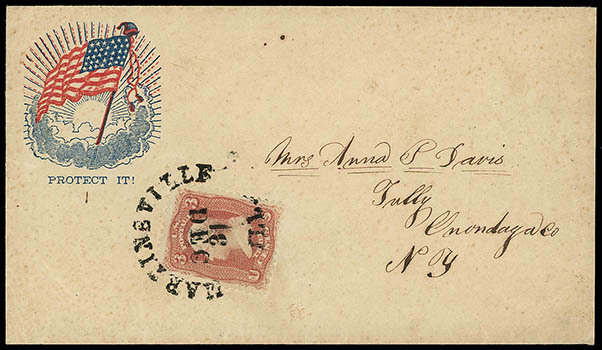 Flag and Steamship, red white and blue Magee design with "Thou too sail on., O Ship of State, Sail on, O Union, Strong and great" verse on cover bearing 3¢ rose (65) tied by "Paid" in circle handstamp and matching "Camden N.J., Nov 21, 1862" cds to Annville Pa.; reduced slightly at left, slight overall toning, F.-V.F. and scarce design. 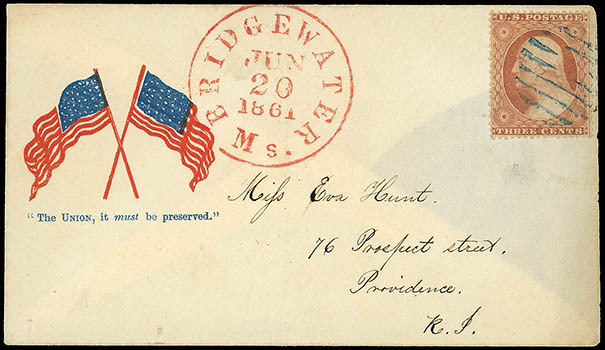 Flags Crossed, blue and red design with "The Union, it must be preseved" slogan below, on fresh cover to Providence, R.I., franked with 1857, 3¢ dull red tied by blue grid handstamp, red "Bridgewater, Ms., Jun 30, 1861" cds; cover missing a sideflap, otherwise Extremely Fine. Scott No. 26. Walcott No. 2873 Estimate $100 - 150. 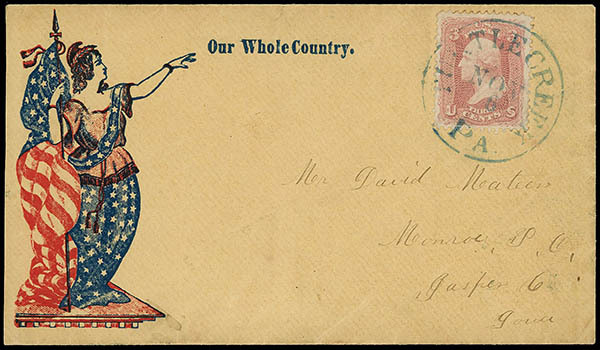 General Winfield Scott & Flag, embossed patriotic design with verse below, on cover to Newport, Vt. franked with 1861, 3¢ rose tied by "Denver City, C.T., Feb 25" cds, with blue Lincoln "No Extension of Slavery" propaganda label, Very Fine, a scarce patriotic usage from Colorado territory with label usage offered on it's own merits. Scott No. 65 Estimate $300 - 400. 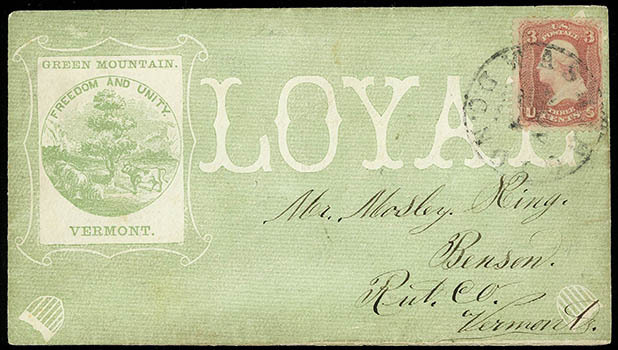 Green Mountain, Vermont, green all-over shaded Loyal State patriotic cover bearing 3¢ rose (65) tied by "Washington D.C. Nov 24" to Benson Vt., Very Fine and attractive. 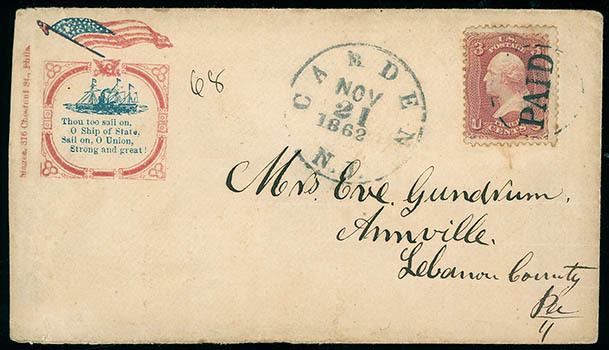 Liberty & Flag, red and blue design with "Our Whole Country" slogan, on cover to Monroe, Iowa, franked with 1861, 3¢ rose tied by blue "Turtle Creek, Pa., Nov 6" cds, Very Fine and choice; with 1999 P.F. certificate. Scott No. 65. Walcott No. 2341 Estimate $150 - 200. 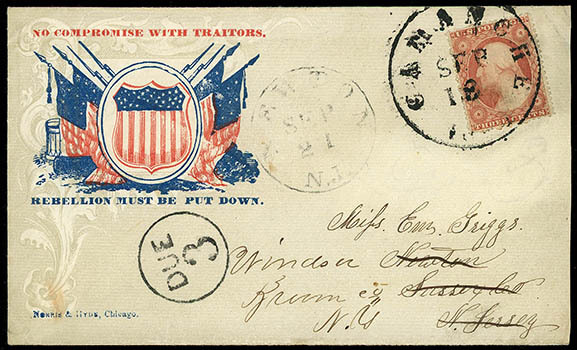 No Compromise with Traitors, Rebellion Must Be Put Down, red white and blue Shield and Flag patriotic design on all-over shaded cover bearing 3¢ dull red (26) tied by "Camanche, Iowa, Sep 18" cds to Newton N.J., forwarded to Windsor N.Y. with "Newtown N.J. Sep 21" cds and "Due 3" rating handstamp; reduced slightly at right, F.-V.F. 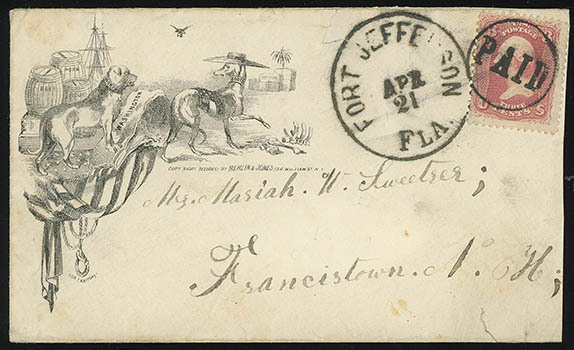 North Verse South Dog Caricature, patriotic design with Berlin & Jones imprint on cover bearing 3¢ rose (65) tied by bold "Paid" circle cancel and matching "Fort Jefferson Fla Apr 21" cds to Francistown N.H.; reduced at right, couple edge tears with one affecting cds, F.-V.F., and exceedingly scarce design, ex-Walcott. Walcott No. W918.